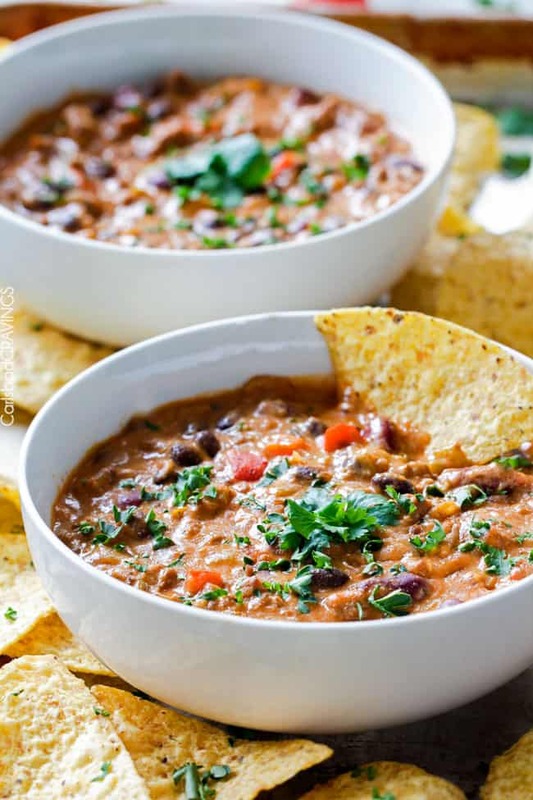 Homemade Cheesy Chili Dip is LOADED with your favorite chili ingredients, spices and SO irresistibly cheesy with NO processed cheese! This is destined to become a most requested crowd pleasing appetizer! You guys, I have it bad, really bad for this Cheesy Chili Dip. As much as I love dipping and dipping in my Homemade Restaurant-Style Salsa and Salsa Verde, this Cheesy Chili Dip takes dipping to a whole new level of addiction. And I can’t wait for you to fall in love too. And cheese. No velveeta, just golden bubbly, creamy cheesy Cream cheese, Pepper Jack cheese and Sharp Cheddar. And that’s what I mean by Homemade Cheesy Chili Dip. And everything is always 1000X better when its homemade. Every hearty mouthful is a party of textures and TexMex spices all blanketed by creamy real cheese sauce that somehow disappears bite after bite after bite until you have eaten an inappropriate amount of chili goodness. And still want more. And so will everyone else. 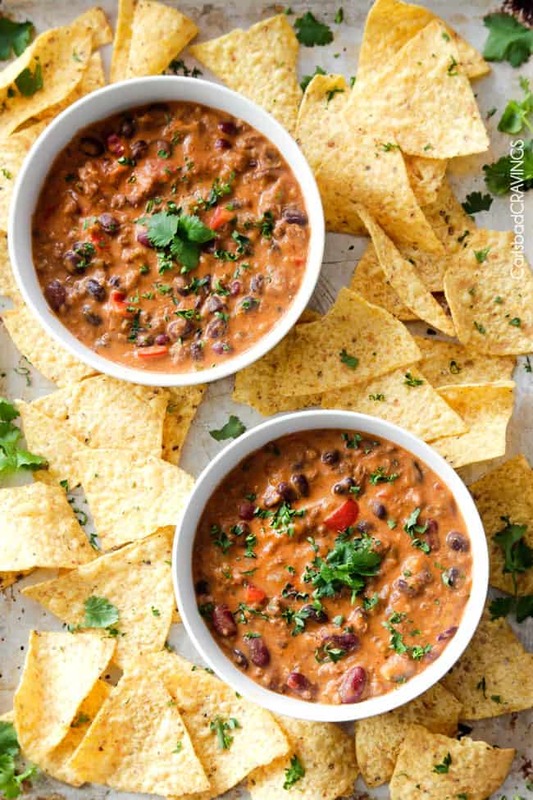 This Cheesy Chili Dip is the ultimate game day food, or party appetizer that is super quick to whip up and bonus! 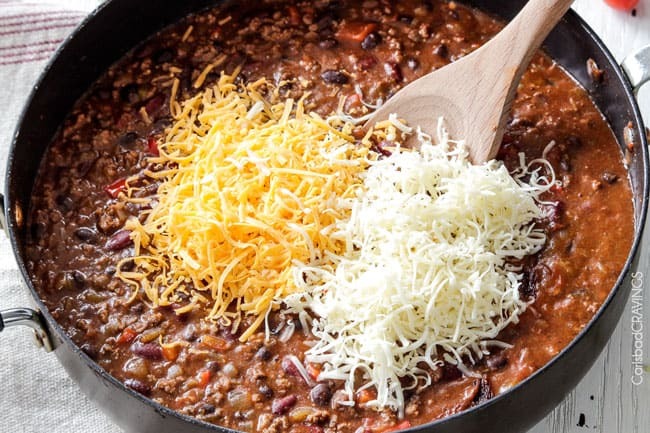 just stir in some milk to create a Cheesy Chili – because trust me – you are going to want to slurp this soup in every possible way. 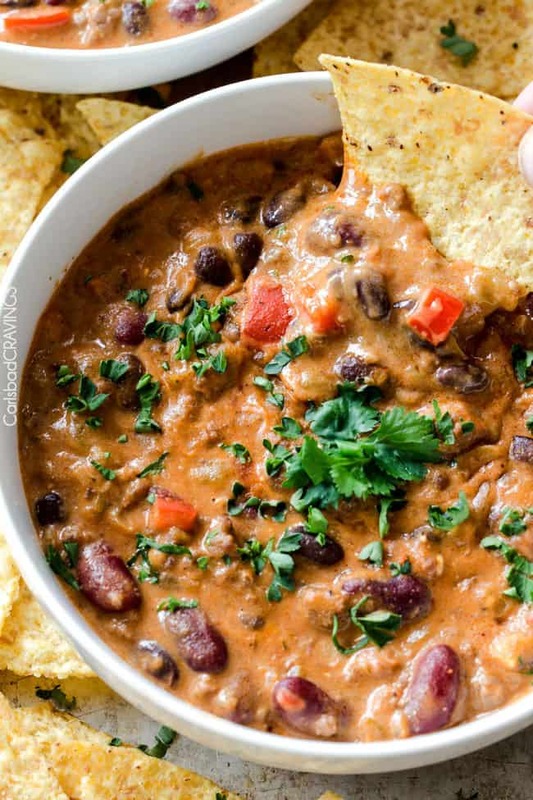 So I suggest you make this today and the next day and then next week so you can get your Cheesy Chili Dip fill (although I don’t think that’s humanly possible) before all those ultra healthy New Year’s resolutions kick in. As for me, I resolve to never deprive myself of you Cheesy Chili Dip. My love. 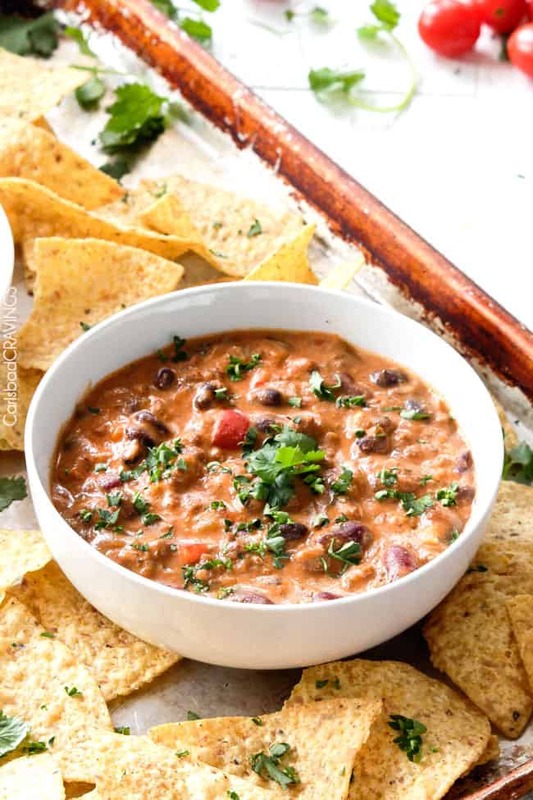 Cheesy Chili Dip – the ultimate creamy, cheesy comforting dip that will be love at first bite. 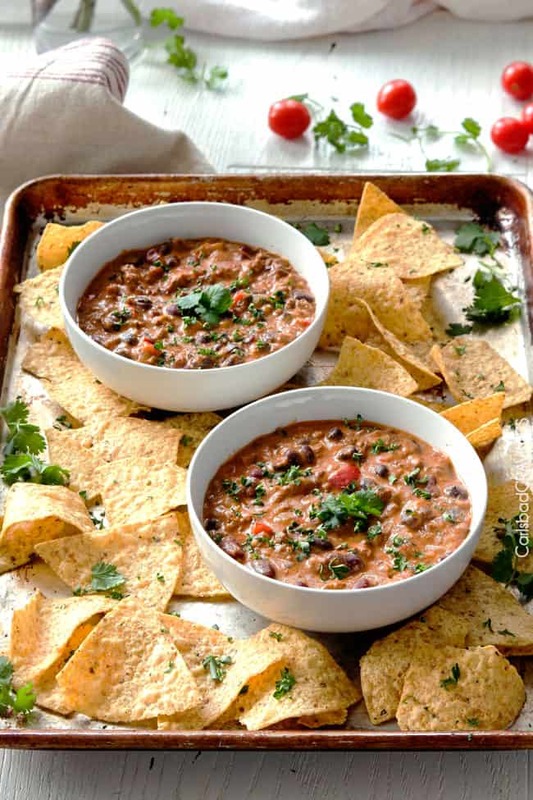 Homemade Cheesy Chili Dip OR Soup! Heat 1 tablespoon olive oil over medium heat in a large nonstick saucepan. Brown the meat with onions until meat is almost cooked through, then add chili powder, cumin, paprika, salt and pepper. 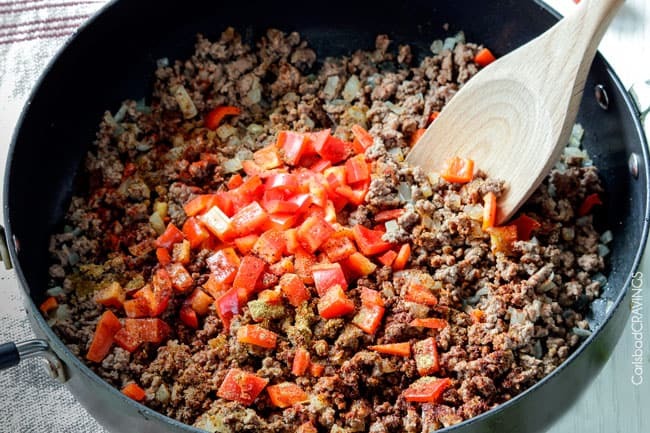 Add red bell pepper, garlic and sprinkle in flour and cook, stirring constantly for 3 minutes. Turn heat to low and stir in cream cheese until melted, followed by pepper jack and cheddar cheese until melted. Add milk to thin to desired consistency for either dip or soup. 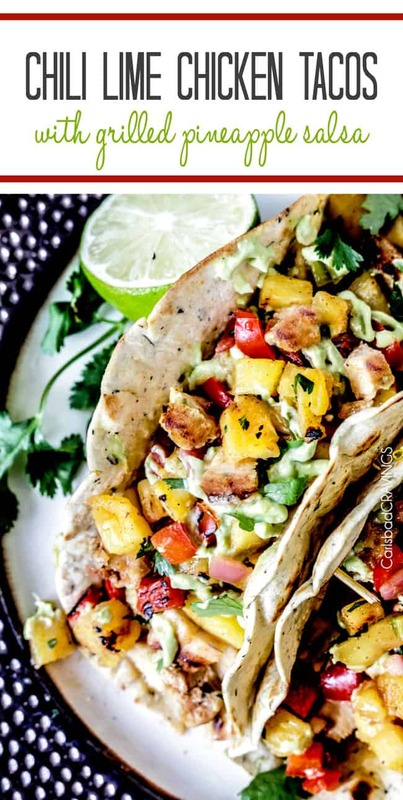 Serve with tortilla chips and additional garnishes as desired. 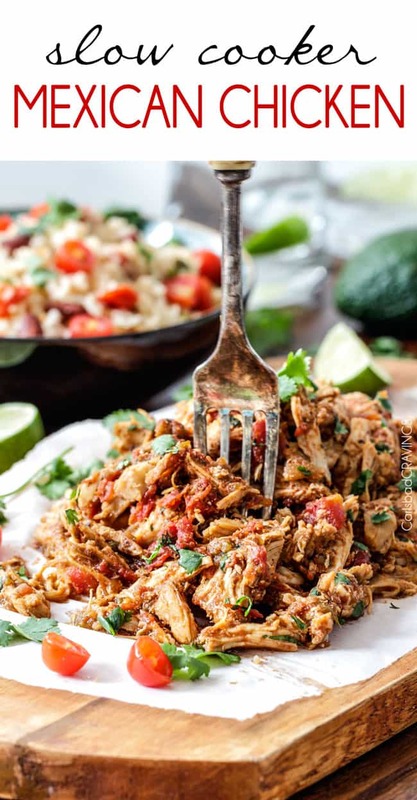 **Once prepared, you can keep the dip or soup warm in your slow cooker until ready to serve. ***This makes approximately 12 servings for a dip and 6 servings for a soup. Thanks Dorothy! I am SO excited for you to make this!! It will be perfect for New Years Eve! Enjoy and happy almost New Year! 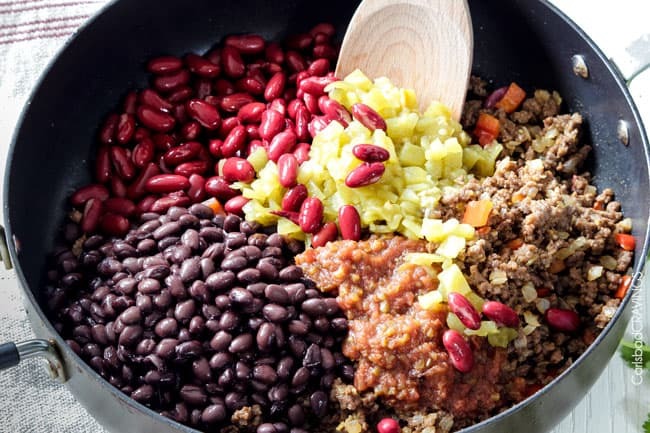 Hubby called this “the best chili I have ever made.” It was delicious – thank you! YAY! I am so you both loved this, especially because it is one of my favorites! Thanks so much Paolina! This looks amazing, can’t wait to try it this weekend! One question…. Do I use red or green enchilada sauce? Thanks! Hi Shaton, I haven’t personally frozen this, but in general chili’s tend to freeze well so I think it should be just fine. Enjoy! My fiancé loves this so much he requests it over and over! He gobbles it up so fast all I get is to lick the spoon. lol Thank you so much for this amazing recipe! HI there! I made this today for our day of football watching! It is so delicious! I think I found a great new chili recipe too! Thank you so much! Awesome Natalie, I love hearing that you enjoyed it so much because this is one of my very favorite recipes! And yes, it makes an awesome chili too! Thank you! I have decided to make this the fall of chili by actually making the chili recipes I have bookmarked. Based on my experience with your other soup recipes, I knew this would not disappoint. More a taco soup than traditional chili, it was delicious. Great lunches ahead for me thanks to this recipe. I love “the Fall of chili” – mmmm! I am so happy it was a hit, thank you Rachel! I have a Creamy White Chicken Chili recipe coming up that you will love! Thanks so much for following along! I hope you find many new favorites! I hope this was a hit Kimberly! 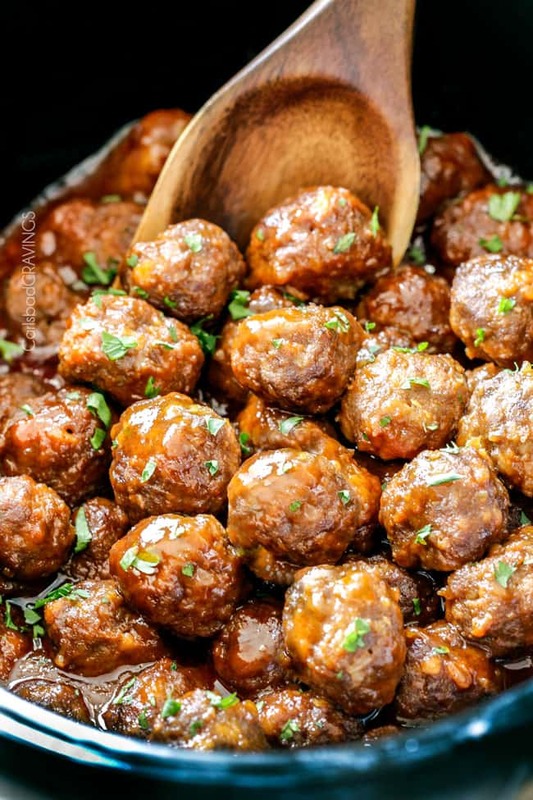 I love your idea of using hot Italian sausage and chuck – a whole new level of YUM! Hi Jen, I’m absolutely loving your recipes, thanks so much! I’m making some chili for a potato bar for our RS activity. Would you recommend this recipe for that? I haven’t made it yet and don’t have time for a trial run. You are so welcome! Yes, I would absolutely recommend this recipe for that – mmmmmm! The only thing you might want to do differently is substitute the Pepper Jack with Monterrey Jack so it’s not too spicy for anyone. Enjoy! Thanks! For 40 women should I double the recipe? Or triple it?